My mother grew up with this Capehart radio and my grandparents gave it to me when I was fishing for radios. Enclosed in a shiny black plastic case and nicely trimmed gold front, the Capehart is a stylistic 1950s design. 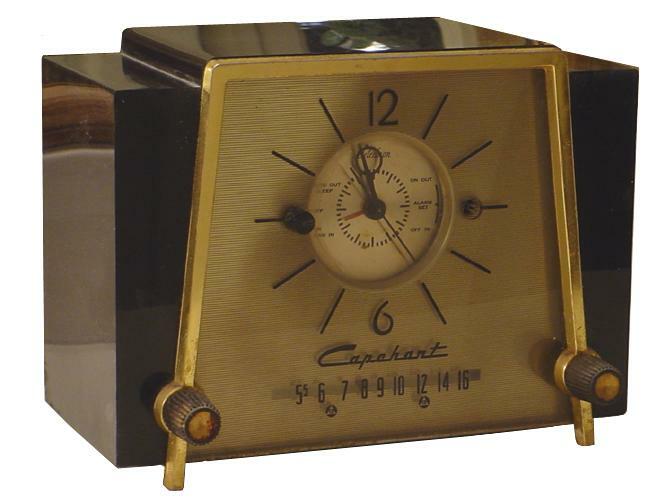 The Farnsworth Radio & Televison Company produced these Capehart radios and used Telechron clocks. The radio design used a selenium rectifier in lieu of a rectifier tube. There is also an ivory plastic cabinet variant.